Until 1894 Sparkhill was part of the Parish of Yardley. This ancient parish has a Saxon foundation with a connection to Pershore Abbey. When Queen Elizabeth died in 1603 there were 90 houses in the parish with a population of 430 people. Today the Parish of Yardley has been divided into many parishes, one of which is Sparkhill. Until 1860 there was no church in Sparkhill, it was then that Mr Thomas Lloyd of The Grange, Sparkhill provided a Day and Sunday School centre for local children. The centre was used for occasional church services and the first recorded baptism in Sparkhill happened here in 1866. When the church was built, Sparkhill was an area of contrasting affluence. There were one or two large houses occupied by successful entrepreneurs and businessmen engaged in the developing industries of Birmingham. It was also an area of extreme poverty where people had migrated to Birmingham to live and work in the many factories being established. For the poor, housing was quickly erected and followed the back to back model with many families living in three storey buildings, sharing a back yard. Although a settlement since Anglo Saxon times, the number of residents had always been few. With the industrialisation of Birmingham, it was an area which rapidly increased its population, serving as an overspill to Bordesley. The population rose to 3,000 in 1860 and by 1880 had doubled to 6,000. By the early 20th century there were sufficient people living ‘on the Hill’ to warrant monthly church services being held there in the open. 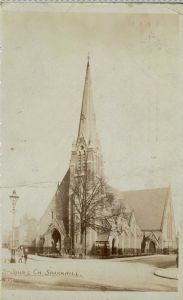 Church services in Sparkhill began on a regular basis in 1860. This early ministry was undertaken by Rev. Swinburn, then a member of the clerical team at Yardley parish church in whose parish Sparkhill lay. It rapidly became apparent that the number of people living in Sparkhill warranted their own church, as their needs were different from those of their rural neighbours. 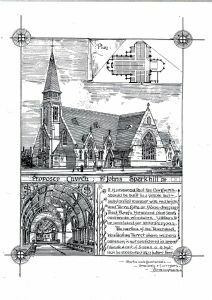 In 1878 a temporary iron church was built on the present site and the Church of England established itself in Sparkhill. Although the provision of a place for worship was a clear priority, it was by no means the only one. There was concern among the committed Christian community for the practical needs of the people in Sparkhill. The issue of education was a national one. 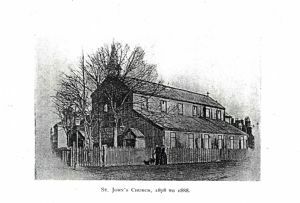 Members of the future St John’s congregation were concerned that all children should be educated in one way or another and built a school for the poor children of the area. 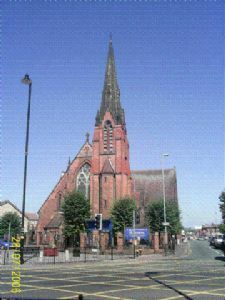 In the early days of the church’s ministry in Sparkhill, the school was used for various community meetings and the Sunday School. This early concern established education as a priority to the church. St John’s School still exists and the links between the church and the school are very strong indeed, with members of the clergy team actively involved in school life on a weekly basis and the church providing a number of governors to the school’s governing body. In a community of such diverse cultures it is interesting to note that people from many different faiths compete for their children to gain entry to the church’s school, which doubled its capacity in 1981 in an attempt to accommodate demand. The current parish is an amalgamation of two parishes, St John’s and Emmanuel, Sparkbrook. St John’s parish also contained a mission hall, St Bede’s. Emmanuel Church was closed in 1990 and is now a residential care home for elderly Asian people, run by Ashram Housing Association. St Bede’s was a mission hall established in Greet, serving the area for 100 years and was closed on its 100th anniversary. Both Emmanuel Church and St Bede’s were important features in the life of Sparkhill and their closure is a mark of the disappearing physical evidence of the Christian community and heritage which belongs to the area. Over the years St John’s Church has been actively involved in the life of the community in many different ways. It has engaged with young and old, providing clubs, outings, activities, support and spiritual direction to many different people in the community. It has provided a focal point for the community in times of celebration and of crisis. In 1880 an average of 760 people attended the church on Sunday, 400 children attended the Sunday schools and there were 29 Sunday school teachers. Although fewer people attend formal services now, a large and increasing number of people in the community use the building facilities. When the church was built, the Church of England was struggling to rise to the challenge presented by an industrialised society. St John’s congregation did its best to rise to the challenge and meeting some needs of the growing community around it. The present congregation sees the ongoing use of the building as a place for Worship and a place into which many people are welcomed as essential to it’s profession of faith and continuance of its 125 year heritage. On the 1st December 2006 St John's became part of the 'Emmanuel' group of Churches. The 'Emmanuel' Group includes Christ Church Sparkbrook, St Edmund's Tyseley, St Christopher's Springfield and St John's Sparkhill. During 2010 and 2011 the church roof was completely replaced and insulation installed. We are continuing to care for and develop the church building for Christian worship and service to the local community.